The 252 badges are awards for achieving a score of 252 at different distances in the outdoor season. Why 252? 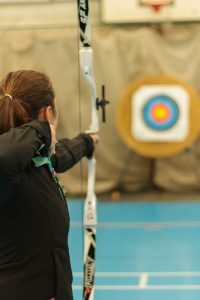 Although different bow types shoot different numbers of arrows to achieve the score, the original idea for recurve bows was to get all the archers 36 arrows within the red or gold zone of the target. With 5 zone scoring this would mean if every arrow went in the red – it would add up to 252. For a Recurve archer to achieve a score of at least 252 for three dozen arrows requires an average score of 84 per dozen, equivalent to 7 or red zone per arrow. The number of arrows shot to achieve the score of 252 varies according to bow type. The awards for the average club archer are achievable but not easy at the longer distances. This makes it challenging for all but the very best club shooters. If you don’t believe us try it with a few of your beginners at 30 yards or club archers at 80 yards. 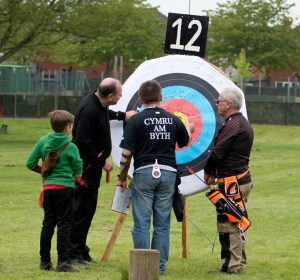 The badges are personal achievement awards and a charge of £2 per badge is made to archers. You can attempt to get all the badges in the series from 20 yards right up to 100 yards in any order but please don’t be too optimistic. GNAS Rules of Shooting to apply. The attempt for the 252 score must be the first shoot of the day, and only 6 sighters are premitted. 36 arrows (3 doz) for recurve bows, 30 arrows (2.5 doz) for compound, 60 arrows (5 dozen) for recurve barebow or 72 arrows (6 dozen) for longbow, flatbow and traditional recurve to be shot at the specified distance using a 122cm target face and GNAS five zone scoring. The round must be shot as a special round on a specific 252 score sheet. Six sighter arrows are permitted which will not count towards the final score. Once the archer has achieved the minimum required score, the 252 badge may be awarded for that distance on application to the records officer. The archer doesn’t have to complete the round if the score has been reached in less than the specified arrows. The order of distances in which badges are obtained need to be in order starting at 20 yards. You can only claim one 252 score per day. It is the responsibility of the archer concerned to make a claim on the correct score card witnessed by at least one other archer, who will record the scores and sign and print their name on completion. The claim should be brought to the attention of the Records Officer, who will be responsible for verifying the scores and claims; and ensuring that the true spirit of the award scheme has been complied with.